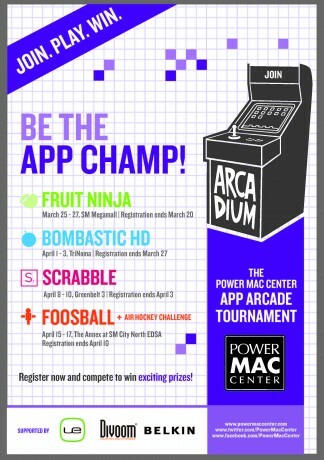 We just received a Press Release from Power Mac Center, They will be holding their first ever App Tournament for the much loved game-apps on iPad and iPod touch..
Just go to any Power Mac Center branch and sign up for your chosen game on or before the following deadlines: March 20 for Fruit Ninja, March 27 for Bombastic HD, April 3 for Scrabble and April 10 for Foosball. Interested participants may also email their name, contact number, age, and the game they want to compete in at [email protected]. Either way, participants will receive a confirmation email from PMC with their competition schedule. Fruit Ninja, March 25-27 at PMC Megamall; Bombastic HD, April 1-3 at PMC TriNoma; Scrabble, April 8-10 at PMC Greenbelt 3; and Foosball HD, April 15-17 at PMC North EDSA. You may also check out updates on tournament details at the Power Mac Center Facebook page. Prizes shall include : a 16GB iPad WiFi, Belkin iPad accessories, and Divo speakers for the tournament champions; and Ultimate Ears earphones and iTour70 speakers for the runners-up. All players are required to arrive 30 minutes before their match. Players who fail to register 10 minutes before their scheduled match will be automatically disqualified. Customers can also drop by at SM North Edsa to play a bonus game of Air Hockey to win gifts from Power Mac Center.